with clients Dave Nagy and Matt Davis. Dave Nagy with golden dorado. Flying to Buenos Aires is about a 10 ½-hour flight from Houston. But for the dorado angler, it’s time well spent. Most people like to arrive a day or two early to rest-up and sightsee in Buenos Aires. Buenos Aires is a huge city with culturally interesting architecture, excellent restaurants, and quaint neighborhood cafés. The Cruiser does not offer a non-angler package. Should your non-fishing spouse desire to tag along, Buenos Aires is a fantastic city for them to explore. Trip start: On Saturday morning, a shuttle van, arranged by the outfitter, picked our group up at the International Airport or our hotel of choice. From Buenos Aires, we took a three-hour van ride north to a marina close to the town of Rosario. 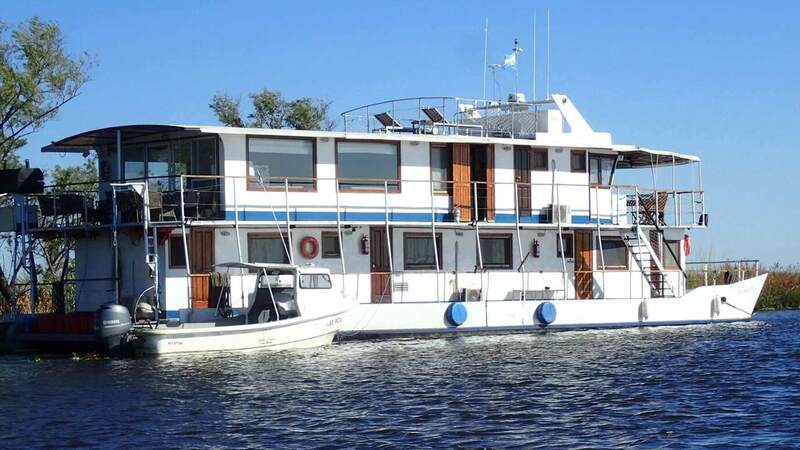 Then, a 60-to 90-minute shuttle boat ride across the main Paraná River and through the maze of channels back into the expansive marsh area where the Cruiser sat moored. The Paraná is the second largest river in South America, the Amazon being the first. The Cruiser, a very nice liveaboard, holds eight anglers a week. Upon arrival, Wessel, our English-speaking host, greeted us. Wessel was very personable. We also met Dario, the Captain. He grew up fishing these waters and knows the area very well. We got settled into our rooms on the lower level. 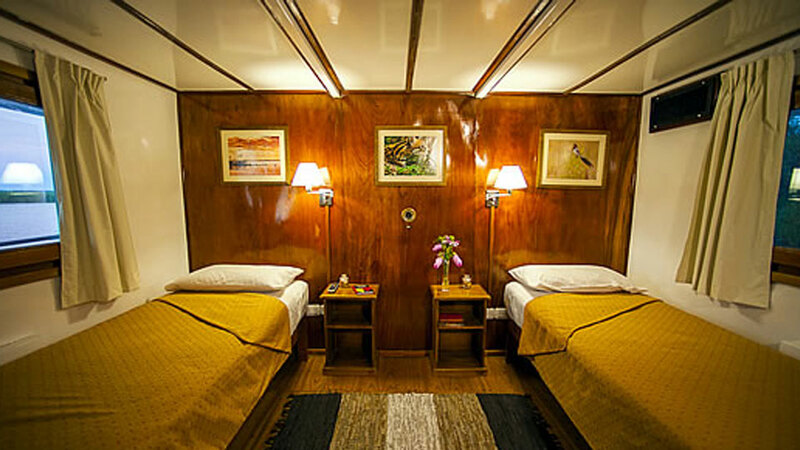 The double-occupancy cabins have two twin-size beds. There are no bunk beds on this liveaboard! There was plenty of space to store our gear, and each room had a bathroom with a shower large enough to turn around in. After we settled into our rooms, we walked up one level of stairs to the main floor lounge and dining area. We enjoyed a nice lunch, then we rigged up, and were able to get in a half day of guided fishing. 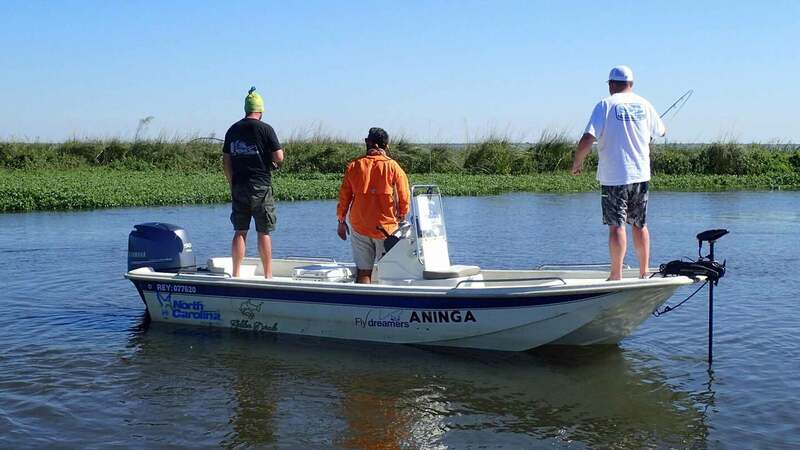 We fished from 17' fiberglass North Carolina center-console skiffs with 90 h.p. four-stroke Yamaha engines, and a remote-controlled bow mounted trolling motor. There are two casting platforms, one in the bow and the other at the stern. The guide slowly moves the boat downriver while you cast to structure and the bank, where the dorado hold, looking for baitfish. The guides used a trolling motor to get you into plenty of unfished water, a very effective way to fish for dorado. The Upper Paraná River Delta is an expansive marsh area.There aren’t very many trees or high points, just water and grass. Boating the river, we saw all kinds of birds, everywhere, and capybara, a little brown animal that looks like a cross between a beaver and an otter. Capybaras are considered the largest rodent in the world. On higher ground, there were occasional beehive boxes and grazing cattle. Before this trip, I’d never seen a cow swim. Seeing a 1,200-pound black Angus swim across the channel to eat the greener grass on the other side was quite a sight. 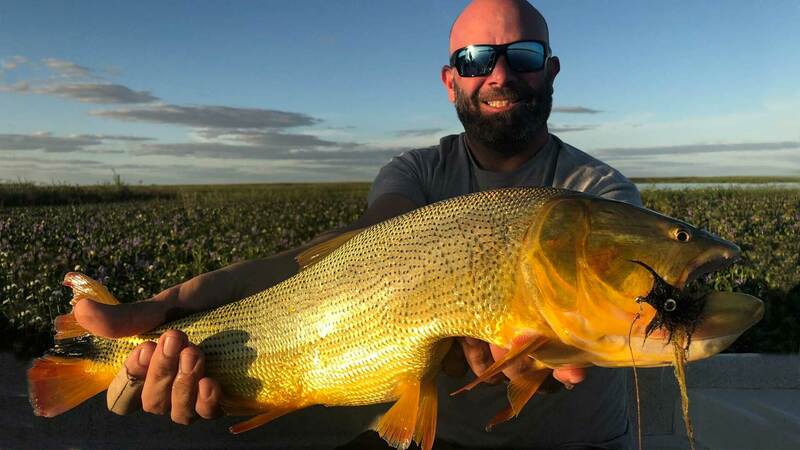 I find golden dorado fishing very similar to my two other favorite species — peacock bass, and baby tarpon. With all three, you’ll cast toward structure or the bank, because that’s where they hold, looking for baitfish. 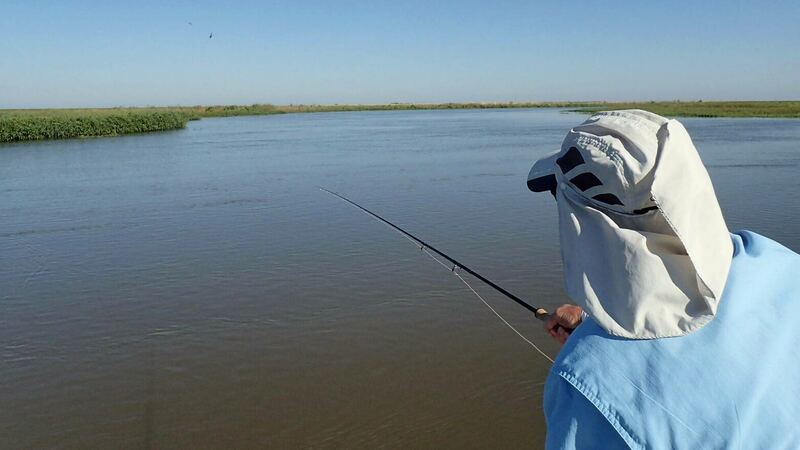 As you’re stripping the fly in, all three species grab it as you strip set with a very aggressive strike and, the second they’re hooked, they jump out of the water multiple times. Always very exciting. Most dorados will be 3 to 6 pounds with some up to 18 pounds. You’ll need to use a 6” to 18" section of 40-pound test wire leader as they have lots of sharp teeth and depending on where they bite the fly with monofilament, they’ll just chew it off. You’ll go through about 18-24 flies during your weeks stay. Most of the flies are 3" to 6" long. 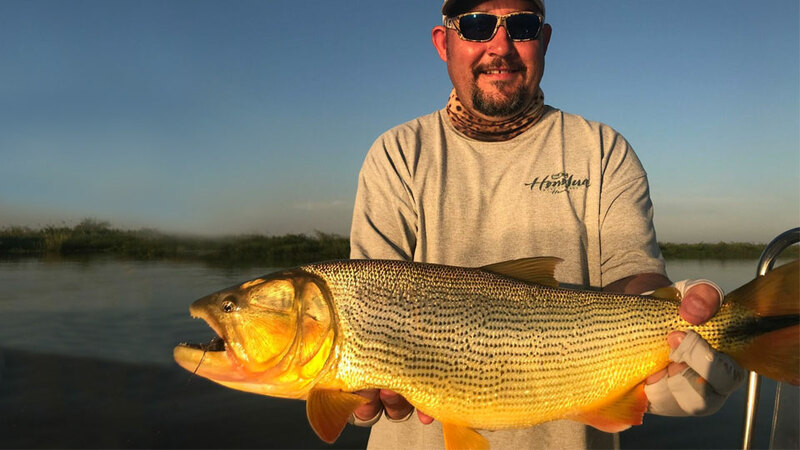 The flies need to be tied on strong hooks and are between 2/0 to 4/0 in size with a large gap to get around the golden dorado’s powerful jaw. You can catch dorados on floating line and sinking line, depending on where you are and what the water temperature is. You are also able to fish with lures on this trip. Each day we fished almost until dark, getting back to the cruiser right at dark. During peak fishing months from October through April, it gets dark between 7:30 and 8:30, which are also the warmer months in South America. 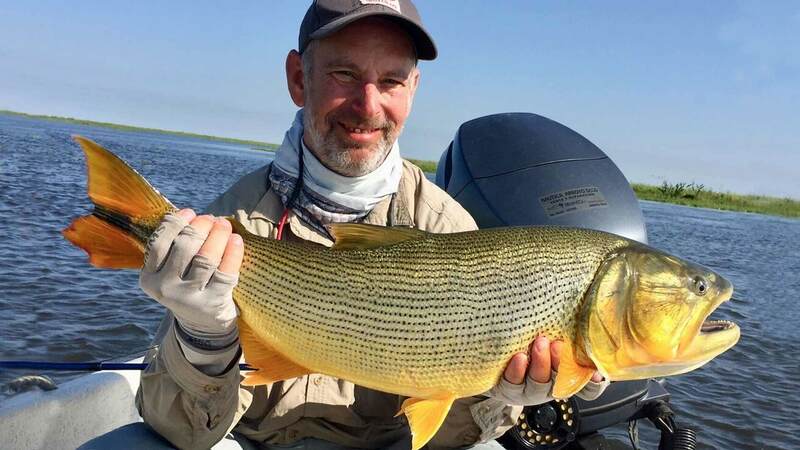 The Golden Dorado Cruiser is a year-round fishing program. 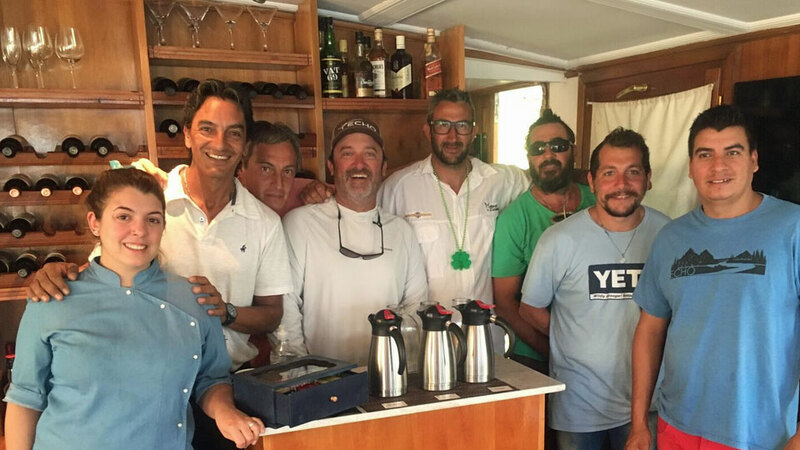 Dario, the boat captain, typically moves the Cruiser once during the week for anglers to access different water. 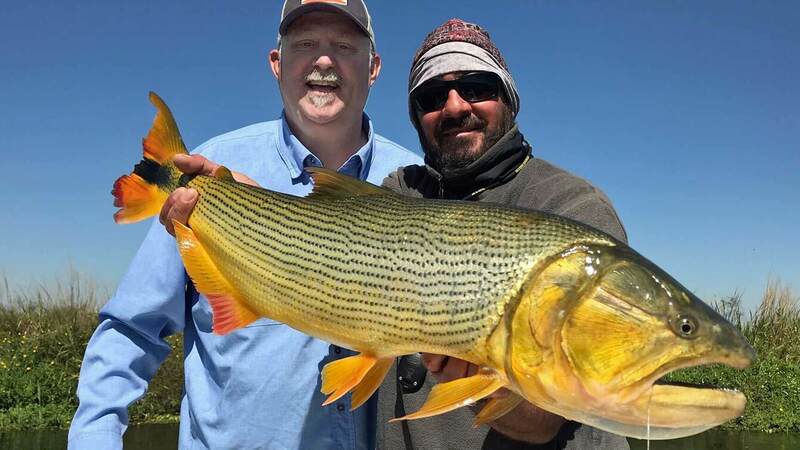 At times, you’ll fish five minutes from the Cruiser; other times, it’ll be a 45 to 60-minute run, depending on where the guides are finding fish. There are some subsistence fishermen around and a few sports anglers. Then again, you might not see another angler during the day, except for your friends from the liveaboard. Matt Davis with golden dorado. 7:30: Breakfast was served. 8:30: We met our guides and headed fishing. Noon: We could choose between having lunch on the riverbank and relaxing for a while or returning to the Cruiser for lunch and a siesta. 2:30-3:00: We returned to fishing. 7:00-7:30: When it was almost dark, we returned to the liveaboard. After we freshened up, we enjoyed delicious appetizers and beverages of choice. I have to say that the food on the Cruiser is the BEST that I have ever had at any fishing destination. I will definitely upset some of my lodge owner friends by saying that. But, there you have it! Nightly appetizers ranged from nuts, chips and dip, dorado ceviche, empanadas, to smoked trout and crackers. Dinners consisted of fish, beef, pork or chicken teamed with rice or potatoes and salads. Once during the week, they did an asado (barbeque) with lots of meat. Excellent desserts were paired with a dessert wine. Wessel did a great job of keeping our wine glasses filled with fantastic Malbec wine from Argentina. 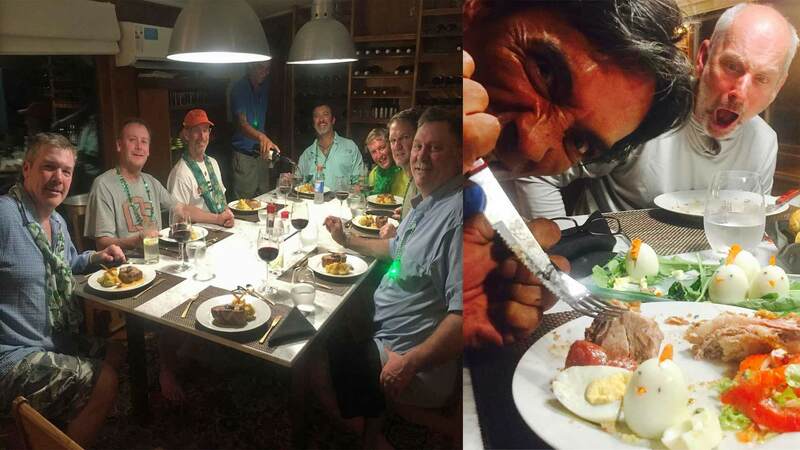 On the last morning, we packed our gear, had breakfast, and took the 60-to 90-minute boat ride back across the main Paraná River to the Marina, and the shuttle van ride to Buenos Aires. At this point, we could've headed either to the airport for an evening flight back home or to a hotel for an extended stay. "That was probably one of the most comfortable and enjoyable trips I've ever been on. The guides were great, and the chef (not cook) was incredible. I'd never been on a liveaboard before. 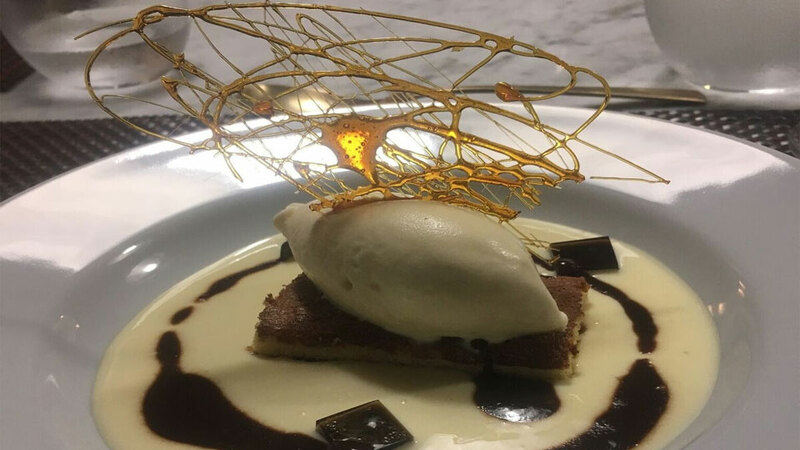 The staff was amazing, the chef was fantastic, and Brad Staples makes you feel as though he's hosting you at his own home!" - Mark Allen. You're not restricted to our hosted weeks; provided there are openings, we can book the liveaboard for a time that works best for you. The Golden Dorado Cruiser is a year-round operation. Prices are subject to change. Please contact me with any questions you might have about this fun fishing adventure. 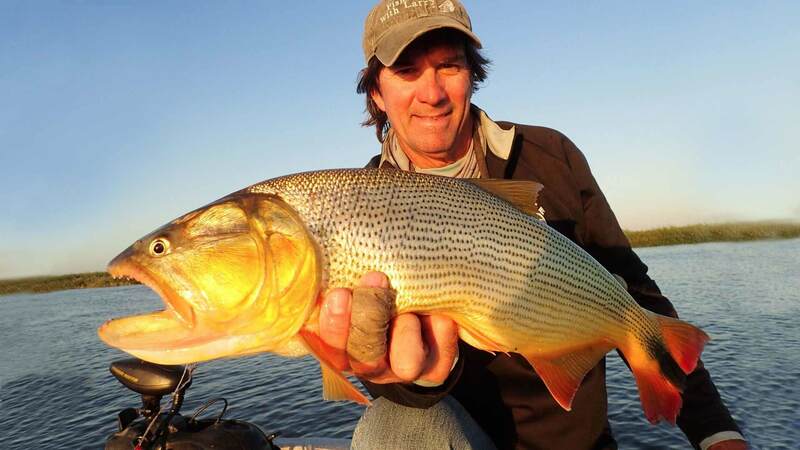 Phil Dollar with golden dorado - Paraná River. You don't have to be in great shape for this trip. There's no wading, and all the fishing is done from the boat. Mark Allen with a large dorado and Enzo, the guide. The guides are great; and, with the use of electric trolling motors, they cover the water very effectively. Enzo, pictured above, speaks English. Most of the guides speak fishing English--just enough to get by. My groups had many fun evenings. One night we had fun trying to get Wessel, our great host, to ham it up for some interesting shots. They told Wessel how to pose, and he was a great sport. And, of course, Phil, shocked in the background, did his part too. 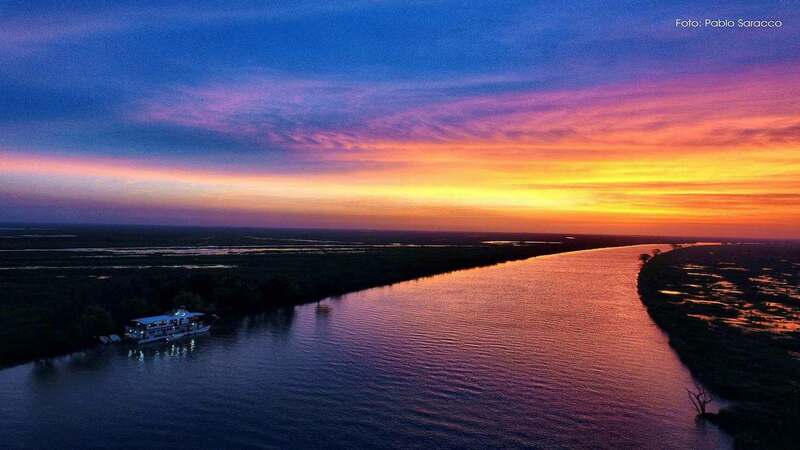 View from the Liveaboard - Paraná River sunset. Please contact me if you have any questions regarding this unique trip. Hope you can join our group here in 2019. Brad Staples 1 (800) 205-3474 ext. 3.